This is a game for two players. Make a pile of ten items. Pens and pencils would be suitable. Each player takes it in turn to remove one, two or three items. The player to remove the last item is the winner. Play the game four or five times then write down any strategies you may have found. Are you good enough to challenge the computer at this game? The computer plays Multi-pile Nim. Variants of Nim have been played since ancient times. The game is said to have originated in China (it closely resembles the Chinese game of Tsyanshidzi, or "picking stones"), but the origin is uncertain; the earliest European references to Nim are from the beginning of the 16th century. Its current name was coined by Charles L. Bouton of Harvard University, who also developed the complete theory of the game in 1901, but the origins of the name were never fully explained. The name is probably derived from German nimm! meaning "take! ", or the obsolete English verb nim of the same meaning. Some people have noted that turning the word NIM upside-down and backwards results in WIN. Nim is usually played as a misère game, in which the player to take the last object loses. Nim can also be played as a normal play game, which means that the person who makes the last move (i.e., who takes the last object) wins. This is called normal play because most games follow this convention, even though Nim usually does not. Tried it with my sister, mum and friend. Would like to see more practical things though. But overall, very good. A great game. What started as a quick starter developed into lots of problem solving. We tried increasing the number of objects, increasing the number of players and increasing the number of objects you could take in one go - 1, 2, 3 or 4. We had lots of fun coming up with strategies, seeing if changing something changed the strategy, and most importantly - seeing if we could beat the teacher! At the very least this game provides some mental maths practice as the players do the calculations required to see what effect their move will have on the possible next moves. A very easy to organise lesson starter activity assuming your pupils come with enough pens and pencils between them! Just play foursies, just leave your opponent with any multiple of four. you can't lose unless you do a dumb dumb on the last 4. This starter has scored a mean of 3.1 out of 5 based on 142 votes. The strategy for the game described at the top of this page is to take the number of items from the pile that will leave your opponent with a multiple of four items on each turn. Here is the URL which will take them to Multi-pile Nim which is a different game but based on similar principles. 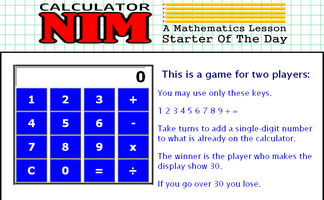 Students might also like to try Calculator Nim.